65 backers pledged ¥256,100 to help bring this project to life. Hi, My name is Mulele. Welcome to the Yakai Kickstarter! What is YAKAI? 夜 “Ya” is the Japanese character for ‘night’ and 怪 “Kai” means ‘mystery’ or ‘wonder’, which directly translates to Night Mystery. Almost ten years ago, Noriko Tamura and I decided to take off on a series of midnight adventures through some of the spookier parts of Tokyo. For her part, Noriko had always wanted to go ghost-hunting, but I was the first chucklehead willing to tag along. And me? Well, I was just hoping for a few ideas that would feed into a comic I was planning. Both of us, though, got more than we bargained for. Although that earlier comic never got made, Noriko and I finally decided last year that it was time to relate our ghost-hunting experiences in a wholly true, yet anecdotal style. The resulting comic series was originally published as a limited edition in Japanese and available only at Tokyo comic cons. In this volume, we are bringing together our first 4 adventures as one 80-page English-language graphic novel. Above are the covers 1 through 4 of the Japanese print run. Linked below is one of the adventures featured in the book. Here are some sample pages, too! Yakai is an 80-page, square-bound book in A5 vertical format. The interior will be printed in black, blue and white on thick high-quality paper to closely resemble the original risography-printed, Japanese version of the comic. 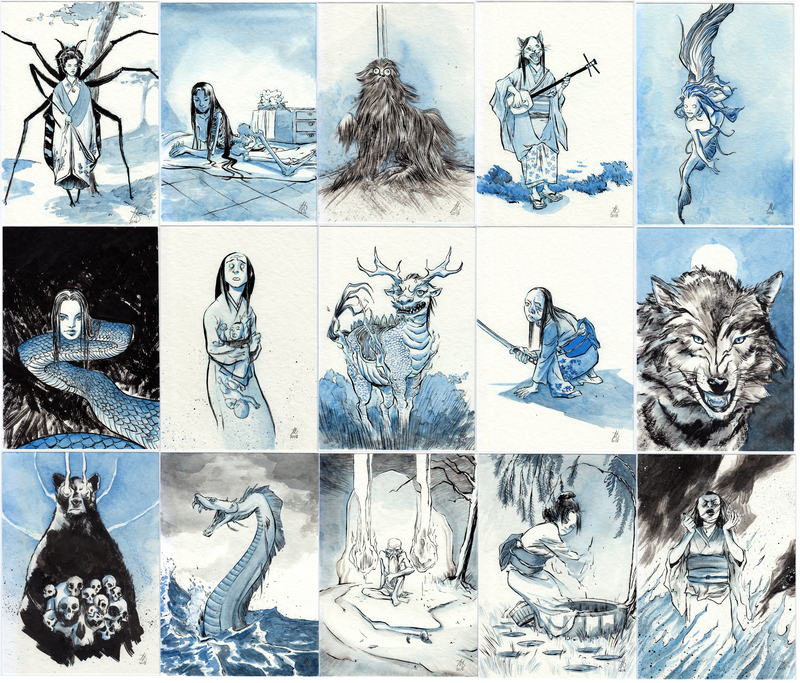 Throughout this Kickstarter I will be posting to Twitter, Instagram and Facebook, under the hashtag #yakai60, illustrations of ghosts and maybe a few monsters from Japanese folktales to give you a taste of Tokyo’s night-time denizens. 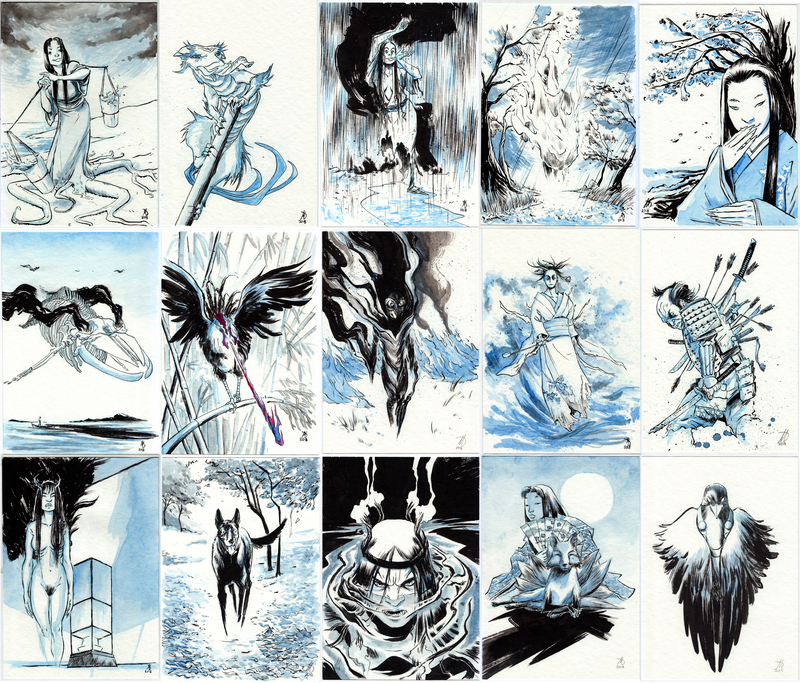 At the end of the campaign I’ll pair each of these 60 original illustrations with books at the Proper Ghost tier and sending them to backers. When the Kickstarter has finished and all of the ghosts have been posted for your perusal, I’ll be sending a survey to all "Proper Ghost" backers asking if you have a preference of which ghost you receive. Of course, first dibs go to the earliest pledge so the earlier you pledge the more likely you are to get the ghost of your dreams. The “Full Body Manifestation” tier has been added for those who want the ultimate expression of “size does matter!” You can ask for a large size illustration of your heart’s desire or you can write your own one-page adventure or paranormal story for me to draw. No confidence in your story writing? No problem! Just tell me what happened and I’ll craft a one-page story for you or your loved one to star in. The artwork is camera-ready. The illustrations are drawn and are being posted twice daily. Once the kickstarter is complete, I will order the print run of the book. All other essentials for packaging and post will be gathered during the printing of the book. Surveys will be sent 1 to 2 days after the kickstarter has ended. PDFs will be sent out once money is received from Kickstarter. Books will be sent out as soon as they arrive from the printer (estimated 2 to 4 weeks). My goal is that the first 3 tiers of this kickstarter be fulfilled by the first week of May with the last tier to be completed by the end of June. Mulele Jarvis is a somewhat reclusive comic artist who scribbles and draws in his hidden lair somewhere within the 23 wards of Tokyo. He has no nom de plume but often publishes under the moniker Mulele Redux and may someday legally change his name. Noriko Tamura is an English/Japanese translator for movies and TV shows. Along with her cat, she hunts for all things Keanu. Noriko is the exclusive Japanese translator for all Mulele Redux books and often finds herself being harassed by Mulele to go eat ramen and to write more comics. She promises this year she might definitely do one of those things. Kickstarter is all or nothing. That means that if I don’t reach my goal Yakai will remain unprinted in English. And that’d just be too bad. So let me take a moment to thank all of you in advance for making Yakai a possibility. I couldn't make comics without you! The artwork and formatting of Night Mystery are complete and is camera ready. PDFs will go to backers immediately upon receiving funds from Kickstarter. A5 Ghost Illustrations will be completed and uploaded to twitter, instagram and facebook during the life of the Kickstarter campaign and will therefore be ready to send out as soon as it can be paired with the physical book. Book printing will take 2-4 weeks depending on the printer's schedule. I have previously worked with this printer on the The Mindgator book 1 and book 2 as well as other projects. I have always found them to be extremely reliable and their work is top notch. Although I mention in the Poltergeist tier that the estimated delivery will be in July, I want to stress that in the event of an overwhelming response, some deliveries in this tier could take longer. In any case, I will draw and send each illustration in the order the illustration request is made and finalized. A DRM free PDF of The Book. Simple, fast and good! Thanks! A book to adorn your shelves or to take with you as you follow the maps to see where we went. One of 60 original illustrations I will be drawing during the kickstarter campaign. All drawings will be on A5 (210mmX147mm) 130gsm cardstock acid-free paper. I will draw anything you want. Anything at all on A5 (210mmX147mm) 130gsm cardstock acid-free paper. No request will be refused but may be subject to the artist's interpretation. A full, B4-size (35.5cm X 25cm), black and blue illustration or short one-page story on 135gsm, acid-free paper, drawn by me just for you.